I was poking around the definition of “national debt”, by consulting various online entities, some of them governmental. “National debt” varies according to what one considers. I was looking to see whether “Quantitative Easing” (the buying by the central banks of depleted assets to the wealthiest to make them wealthy again — the way it was done by our unforgivable leaders). The smallest interpretation of “national debt” in the case of the USA is around $13 trillions, 80% of US GDP. That smallest notion of debt considers only the FEDERAL debt held by the PUBLIC… After excluding all sorts of obligations (like Fannie Mae and Freddie Mac, real estates entities held by the US government)… or what the US government owes to future Social Security recipients (most of the US population). The smallest number is what the Demoncrats love to brandish. However, it will not affect the stunning discovery I made (below). 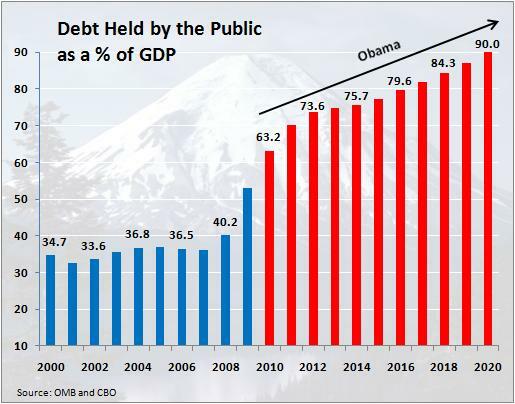 Obama augmented enormously the US National Debt. What for? The OECD considers that US government debt, including state and local government, is 125% of US GDP. By comparison, the OECD considers that the “general government debt” of socialist France is a bit less, 120% of GDP (same link). 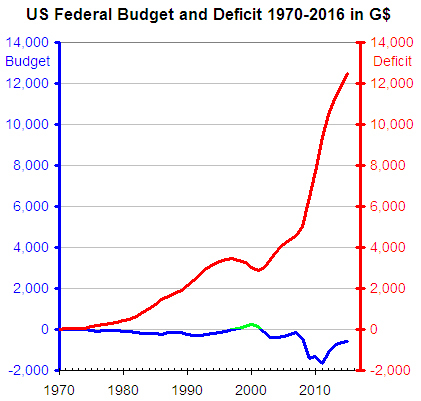 The US government seizes some revenues, like the Social Security tax and consumes it right away (instead of putting the money in the Social Security Trust Fund). The result of this sort of maneuvers is “intergovernmental debt”, which is around 6 trillion dollars. I knew this. This “borrowing” from Social Security has to be absolutely incorporated in the notion of National Debt, because it represents borrowing from the Public by other (unwilling) means. Fair accounting requires to do this. But then I learned something new, which jumped at me. The US National Debt reached 106% of GDP in July 2016, six months later. That is an annual rate of augmentation of roughly 10% a year. In a way, it makes sense: when Obama was inaugurated, the US National Debt was just 68%. So, in seven years, Obama increased the US debt by 33%, a rate of augmentation of nearly 5% a year. So Obama just doubled his rate of augmentation of US debt in 2016. @Tyranosopher @CraigRBrittain @wikileaks Just this alone should be enough to validate Hillary’s loss. And this debt catastrophe is not going to improve: the cost of Obamacare is up 25% from 2016 to 2017. The New York Times and the Reaganite Paul Krugman (the fellow Nobel of Obama and self-aggrandizing, self-described as “the conscience of a liberal”) swooned that this 25% jump in Obamacare cost, was just a one-time augmentation. However, as there are no serious cost controls in Obamacare, this is highly unlikely: taxpayers will have to pay increasingly plutocrats such as Warren buffet, who made many billions out of US health care, to better lecture the losers down there who don’t know how to invest or work, and, moreover, vote for Trump. One may wonder how, mechanically dear leader Obama generated so much debt. The following graph explains it all: Obama lowered the taxes on the wealthy, while showering the poor with gold, and various services, to make them stupidly favorable. This is a very old method, invented and practiced industrially, by Roman emperors (it did not end well). Under Obama Tax Receipts, Which Come Mostly From Taxing The Rich, Were Kept Artificially, Unsustainably Low. No Wonder the Hyper Rich Were Mostly All For Obama, And Against The (For Them Frighteningly) Unpredictable Trump. So Obama was a Progressive In Name Only (PINO), or DINO (Democrat In Name Only). He built up a giant deficit, and thus National Debt, so that his friends would stay rich. A related matter is the striking improvement of some US socioeconomic metrics in the last couple of months before the US presidential election. For example, the US median family income rocketed up in the last few weeks before the elections.. I was very surprised by this, and suspicious. Indeed, the US median family income peaked, in real dollars, in 1998, when it succumbed to Bill Clinton’s pro-wealth policies of the Goldman Sachs government. Ever since it has been down, as Democrat and Republican leadership followed the sort of Reagan, trickle down policies which got great demoncratic leaders such as Robert Rubin, Lawrence Summers and Paul Krugman launched (Rubin was CEO of Goldman Sachs, while Summers and Krugman were at the White House, telling Reagan what to do). In Brazil, president Dilma Rousseff did a similar trick: she cooked the numbers to make the economy look better than it really was. She was re-elected, thanks to those numbers, but when the cooking surfaced, and started to smell bad, she was impeached. It turns out that the Brazilian sociopolitical leadership is thoroughly corrupt. All the way to socialist icons and ex-guerillas (such as Dilma; by the way, Dilma did not profit personally materially from the cooking of the numbers… except that she got, however fleetingly, re-elected). Some will say that the USA is not Brazil. Indeed, the USA is much more corrupt, so the institutionalization of the corruption in the USA is hard to even point out, lest one is ready to be called a lunatic. It is not just financial corruption, it’s also media, even mental corruption, which is more extensive in the USA: when Brazilian leaders lose an election, they don’t accuse Russia. So did Obama’s underlings cook the numbers? In light of the stupendous augmentation of the debt in the months prior to the presidential election, one can only be suspicious. Augmenting the US National Debt, my dear Obama, at a ten percent annual rate, was trying to buy the presidential election. That’s how history will remember it. History will also remember that you tried to lower the American Republic to the status of vulgar Banana Republic, by claiming it was all Russia’s fault. For years, the USA crowed that it was the world’s hacking master, even making Iranian nuclear equipment spin out of control (Stuxnet virus). Vast arms of the government masquerading as private entities, among them Apple, Facebook, Amazon, Microsoft, were hacking the world, and it was fine. A real democratic republic and open society should never underestimate others’ propensity to mimic anti-democratic, anti-republican and vicious means! Behaving badly feels good, until on is found out by the public. Happy new year Obama and your sycophantic pro-plutocratic media!